Belgharia is a suburb and a city north of Kolkata. It is situated near Barrackpore Trunk Road under Kamarhati Municipality. 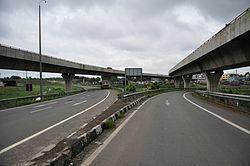 Now it has become a business hub, well connected with Kolkata through trains, buses and other means of transport. The name "Belgharia" is derived from "Bell Ghor". There was a Big bell used for calling the porters for unloading and carrying jute from the boats. The oldest jetty was situated in Ariadaha on the river Ganges. In the 17th century Belgharia and Nimta were the biggest wholesale markets for jute, fish and vegetables. Belgharia is one of the stations on the main train line starting from Sealdah. This place is a suburb of Kolkata city capital of West Bengal in India. Feeder road is one of the main roads in Belghoria. Feeder road connects Belghoria to B.T. Road (i.e. Barrackpore Trunk Road) to the west and through Madhusudan Banerjee (MB) Road to Birati and consequently to Jessore Road in the east. Ramakrishna Paramhansa visited this place eight times; the first time was in 1875. Ramakrishna Mission is also situated here. They run a Students' Home for meritorious poor and needy students along with a three-year Diploma Engg. College . They also conduct relief activities with a public library and homeopathic dispensary. Swami Vijnanananda, a direct disciple of Ramakrishna also resided here. The nearest Industrial area is Kamarhatty (3 km), with the following companies: Agarpara Jute Mill, Allied Ceramic, ESDEE Allumina, Emami, Kamarhatty Jute Mill, Texmaco, TIL, WIMCO .A small unit of Ramkrishna Mission is situated here (near Belgharia flyover) which was established by Swami Vijnananandaji, architect of Belur Math. Nearest Railway Stations are Belgharia, Birati and Baranagar. The newly built Belghoria Expressway which links Jessore Road with Dumdum Airport and Nivedita Setu on the Ganges increased the importance of this place. Belgharia still oozes old world charm of Bengal. The cosmopolitan culture of new age Bengal hasn't yet penetrated the town. The population consists of generally middle class Bengali. Of late a lot of student messes has sprung up chiefly because of the comparative low cost of living and close proximity to the city of Kolkata. Belgharia is an area under Kamarhati Municipality and some parts fall under the area of North Dumdum Municipality.